On the ballot today is the York Peppermint Wafer Bar. Will it be a flip or a flop? (I don’t know how ‘flip’ applies. That’s just what came out.) 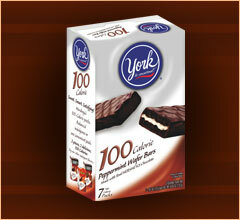 The York Peppermint Pattie is a classic combination of dark chocolate and soft peppermint. Can the 100 Calorie version compare to the classic taste? Let’s find out. Just like with the original Peppermint Pattie, the first bite of the York Peppermint Wafer Bar brings the strong flavor of peppermint. I could immediately feel my sinuses opening up as I chewed and inhaled the peppermint aroma. So far so good, I like it. The chocolate blends with the peppermint flavor perfectly. They complement each other and neither seems overpowering, which is a different experience than I have with a York Peppermint Pattie. (When I eat one of those, I feel like I can barely taste the chocolate.) In the Peppermint Wafer Bars, the flavors are balanced very well. There is one major difference between the original and the diet York that some people may not like (but I love). Notice that the name is Peppermint Wafer Bar. Inside this little mint and chocolate combo are two layers of chocolate wafer. The entire bar has a decided crunch to it that cannot be overlooked. It’s as crunchy as a Kit Kat, maybe even crunchier. I’ve enjoyed this new and different version of the York Peppermint very much. I’m not even overly enamored with mint, but the flavor combination and crunch of the Peppermint Wafer Bar makes it irresistible to me. I was trying to make the two bars last until I finished writing the article, but I couldn’t do it. It’s interesting to note that the original York Peppermint Pattie has only 140 calories so you’re really not saving much by eating the 100 Calorie Bar instead. That makes the choice completely a matter of personal preference. However, I did notice that the total fat content of the Peppermint Pattie is 2.5 grams while the total fat in the Peppermint Wafer Bar is six grams. Amazing! Surprising! Shocking! On a diet or not, the 100 Calorie Bar line offers tasty confections to satisfy the sweet tooth. Each 100 Calorie packet contains two bars, and each box contains seven packets. If you have strong willpower, that’s a week’s worth of candy! Don’t forget the other 100 Calorie Bars – Hershey’s Special Dark and Snickers, both of which are miniature versions of their larger counterparts. (No changes like wafer where there was no wafer.) If you know of other varieties that I haven’t discovered, let me know! i never really went for peppermint patties, but one with a wafer crunch? hmm… i am off to do some unrelated shopping at the grocery store :-). I’m loving this series because these 100 calorie babies are lots of fun without the guilt. I’m usually not a huge mint fan but I like Peppermint Patties occasionally and I’m definitely intrigued by the crunch in these!